You risk damaging your kitchen worktops if you are slicing and dicing your food directly on the counter and those things are not easy to replace! If you are not damaging your worktops because they’re really really hard then you will almost certainly be damaging your best kitchen knives! A good solid chopping board will make your food preparation tasks easier and more hygienic whilst protecting both your work surfaces and your kitchen knife set. As the owner of a domestic kitchen you will probably want a couple of chopping boards at least, one for cut raw meat, and another for cooked meats, vegetables and other foods to help avoid contamination. A chopping board will need regular maintenance and cleaning no matter the material. There are a variety of sizes and materials available but which chopping board is best? 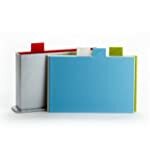 Chopping boards come in a variety of materials, each with advantages and disadvantages. 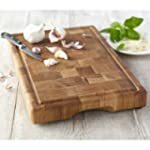 A good chopping board must not damage the fragile structure of the knife edge, nor will it chip it, so the ideal chopping board material will be soft, easy to clean, and non-abrasive but it must still be strong enough to stay in one piece. Harder materials can be used for food preparation that does not require the use of a sharp knife such as making a sandwich or cutting a tasty chunk of cheese. Let’s take a look at some of the materials that are commonly used to make the best chopping boards. Wood is one of the oldest construction materials known to man. It’s an old classic and one of the best materials to make a chopping board from. It’s a pretty tough material that is hard to break but it’s also ever so slightly soft which means it will not rapidly dull your kitchen knives. The best sort of wood to use to make a chopping board is a good hardwood with tight grains and small pores. This sort of wood will help to reduce scoring, and liquid and dirt absorption into the surface of the chopping board. Some food hygienists do not endorse the use of wooden chopping boards as it has long been thought that the porous nature of wood will result in a build-up of bacteria which could potentially contaminate food. This claim is refuted however. Shallow cuts in the wood will close up, especially when the grain swells as the board is cleaned with water. Wood also has natural anti-microbial properties as well. Essentially, through the process of capillary action, bacteria get sucked into the wood into an inhospitable environment. It can no longer breed or grow and will soon die. A study supported by the World Health Organisation by Cliver and Kaspari for the Journal of Food Protection (1994 – The Antimicrobial Properties of Wood verifies this. A wooden chopping board that is well looked after will last for years, a high quality one may last a life time, but note they are not as easy to look after as a plastic board. For a start they are not dishwasher friendly so you will have to wash it by hand, but don’t leave it to soak in water otherwise there is the risk of the board warping and cracking. Every now and then you will need to re-oil your board with a food-grade mineral oil to protect from staining and warping. A good board will come with instructions on how to do this. 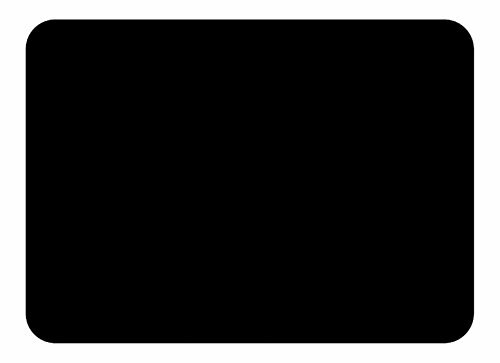 As a general guide twice a year will suffice, however when new the board will need a more intense initial treatment; about once a month for the first half a year of ownership. Bamboo boards are touted as the ‘eco-friendly’ chopping board, and it’s true. Unlike plastic boards bamboo is a renewable material just like wood. However the eco advantage it has over wood is that it is much more sustainable due to its rapid rate of growth. The cultivation and harvesting of bamboo is also free of pesticides. Bamboo really is a fast growing plant; this means that a bamboo chopping board will be cheaper than a wooden chopping board of comparable quality. Bamboo is a very hard material that does not offer the impact absorbing properties of wooden chopping boards so it will be harder on your knives, however heavy duty chopping can be carried out without the risk of shattering or splintering your board’s surface. It is also a light weight material so transporting finely chopped food across the kitchen will be a lot easier than with a heavy wooden chopping board. Bamboo chopping boards should not be immersed in water as they will warp. The lack of grain, and knife damage, should result in fewer bacteria on the board but they do have a propensity to absorb stains. Bamboo boards need oiling with a food-grade mineral oil more regularly than wooden chopping boards. 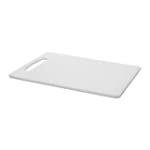 Plastic chopping boards are very common today, especially in commercial kitchens where they can withstand regular harsh cleanings with bleach and exposure to water inside hot dishwashers without retaining any chemicals. Plastic chopping boards are cheap though so they can be replaced easily and frequently. They are functional and their light weight is very useful for transferring food to the cooking pan or bin. They just don’t look as good as the best wooden chopping board though and there relative lightweight means they can slip easily which is an injury risk when chopping food with a sharp kitchen knife. These boards are very easy to clean but they damage knives very quickly due to their hardness. Blades will roll and chip on these smooth hard surfaces. These boards are not really designed for chopping food with sharp knives. They are really for rolling out pastry and dough, or preparing sandwiches or serving cheese. If you’re looking for a chopping board that has a beautiful and traditional look, then this one is a really good purchase. It’s made from oak, giving it a reliable strength and solidity as well as looking very attractive with its patchwork oak construction. Unlike most chopping boards, this has an exceptional thickness that makes it really easy to use and move around. With non-slip feet, you can use force for chopping harder foods without worrying about the board sliding which is probably one of my favourite features here. There’s a groove around the perimeter to catch crumbs that is handy but requires careful cleaning to avoid becoming a germ trap. 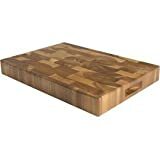 Lakeland has a good reputation for producing high quality cooking goods and I’m quite taken with this board overall. The chunkiness and wood pattern make it an eye-catching kitchen accessory and prevent it from warping and it would definitely suit most kitchens, as it’s traditional but not plain. The important thing with a wooden chopping board is well sealed wood and a smooth finish. Cheaper wooden boards leave you with splinters, stains and smells and it’s crucial to avoid them if you want your board to last more than a couple of months! This oak board is pleasantly smooth and the finish is excellent. It looks and feels like it has the quality to last for a long time, even in a busy kitchen. At this price, it’s not the cheapest chopping board but wooden ones are frequently more expensive and I think here, the price is easily justified. I must admit, it always takes me a while to adjust to glass chopping boards because of the noise they make but this board is actually multi-purpose enough for that not to be so much of a problem. If you’re looking more for a worktop protector for hot pans or dirty implements, then this will do absolute wonders and if you’re looking for an all-rounder, then it can easily be used for chopping too. The surface is a beautiful rich black and suits all kitchens, from the traditional country kitchen to a sleek, modern one. Because it’s a glass surface, it won’t stain and is exceptionally easy to clean so you don’t have to worry about germs residing in it. The perfect surface for grating cheese on, you can also place it in the middle of the dining room table for hot pans, keep it by the stove to protect the work surface as you move hot things around or use it as a chopping or sandwich-making board. The versatility makes this sophisticated design very seductive. Resistant to temperatures up to 250 degrees Celsius, this board also has rubber feet giving you reassurance that it won’t slip or scratch your work surfaces or table. Its simple and effective design allows it to be left out without looking messy and to be used for just about anything, with merely a quick and easy clean in between. Although glass if a very different material to cut on than wood, this board has gone some way to convincing me that glass can be better, especially due to its myriad other uses. If you’ve ever worked in a professional kitchen, you’ll know just how chefs value their colour coded chopping boards. For a busy home, it’s crucial to have separate boards for different uses, especially when it comes to meat versus vegetables. 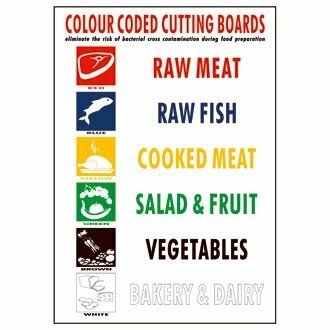 Different boards also means odour contamination is prevented (you don’t want cake tasting of onions) and gives you a range to use instead of repeatedly washing up during the meal preparation. 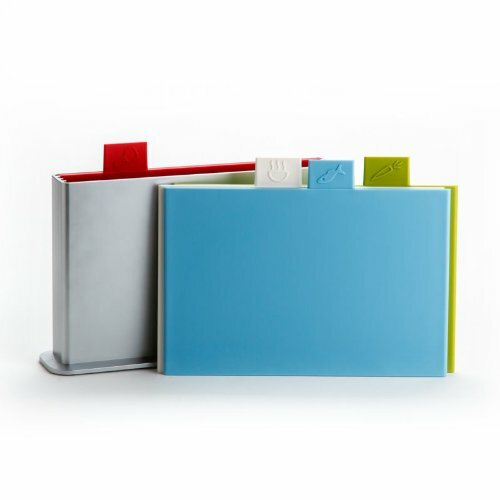 This rather fancy looking set comes with four colour coded, tabbed boards for raw meat, fish, vegetables and cooked foods. They come in a stand and, admittedly, look pretty swish on the kitchen side when all put away. The easy storage and easy selection are great ideas but these boards do have drawbacks. Firstly, they mark exceptionally easily. Yes, a chopping board is for chopping and you should definitely expect knife marks to an extent, but these will show every single cut after just one round of meal prep. The main problem with this, ignoring the aesthetics, is that each tiny groove is a nesting place for bacteria and more knife resistant boards are definitely more hygienic. Secondly, without non-slip feet, these boards slide around way too easily for my liking. I’ve used plenty of boards without feet that are very stable but these are not as stable as I would like when brandishing a knife. If you have a non-slip mat for your kitchen, then you would do well to put it underneath but a simple tea towel won’t work. This is disappointing really as it is such a simple addition. Although these boards look great in their rack, I would really consider how much you’ll use them, especially for the price. The easy marking and slippery nature make them an unwelcome kitchen guest. 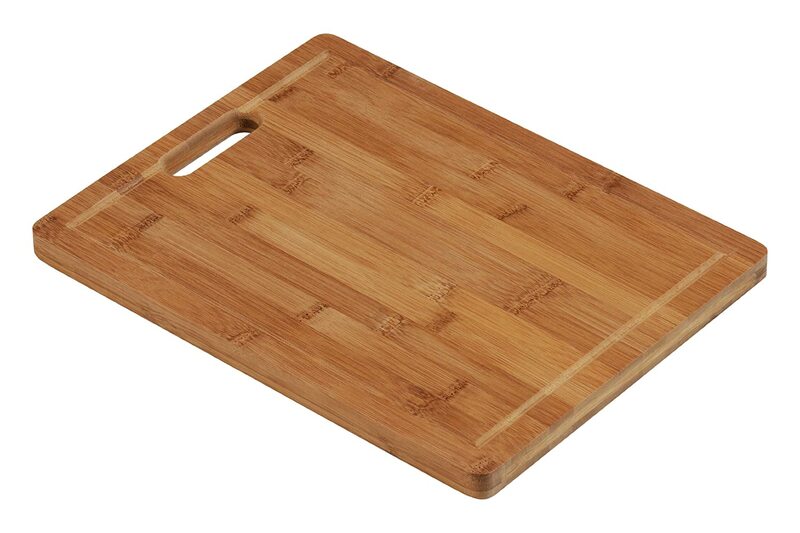 Simple and effective is how I would sum up this bamboo chopping board. It’s a nice weight and feels solid while not being heavy or awkward. It has a handle that I really appreciate as it makes washing very easy and won’t slip out of your hand like some other boards when wet. The bamboo construction gives this board a clean, light wood finish that suits traditional and modern kitchens alike and is a good, average size. With the addition of the almost decorative crumb groove, I would be happy to lay this board out on the dinner table as a serving platter and am always a fan of presentable chopping boards. 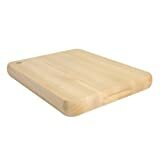 Good quality bamboo chopping boards are a pleasure to use and this one certainly looks and feels the part. One niggle is that the surface doesn’t quite feel as smooth as perhaps an oak board but it doesn’t detract and won’t leave you with splinters like dirt cheap bamboo boards can. For the price, I wouldn’t sniff at using this board every day at all and while it’s not a truly top quality wooden board, it will do its job easily. Whether you go for this or a slightly more expensive wooden board will really depend on how much you’re planning on using it. For heavy every day use, perhaps look into a solid oak board, but for light every day use, this should serve you well. Perhaps you are looking for a bespoke or customised board for your kitchen? If so make sure to check out our page on Personalised Chopping Boards.